How to convert AVI to MP4 format? For playing videos in AVI format on MP4 players, an AVI to MP4 converter is needed. 4Media MP4 Converter for Windows is professional MP4 converter which helps you convert all popular video files to MP4 format like convert AVI to MP4, WMV to MP4, MPEG to MP4. 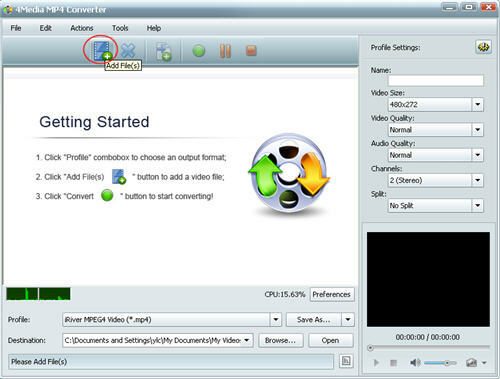 This guide will show you how to convert AVI videos to MP4 format step by step. Launch the MP4 converter, then let's start the conversion. Click the "Add" button to add the AVI video files you want to convert to MP4 format. You can just add several AVI files to convert at the same time. Step 2: Set output format as "MPEG4 Video"
Open the profile drop down list, and choose the output format you want: Choose general MP4 Video(*.mp4) or choose a MP4 video format for Apple TV, Archos, Creative Zen, iPhone, iPod Touch, iRiver, PS3 or PSP if you want to put AVI video on these devices. And for convenience, you can click "Browse" button to change the default destination for target files. And for skilled users, set video size, video quality, audio quality, channels (mono or stereo) in the right setting panel to get customized MP4 video. Click the green "convert" button to start converting the checked files. The AVI to MP4 conversion will be finished in just a minute or so. Then you can click "open" button to check the converted MP4 videos - Play them or put them onto your device. 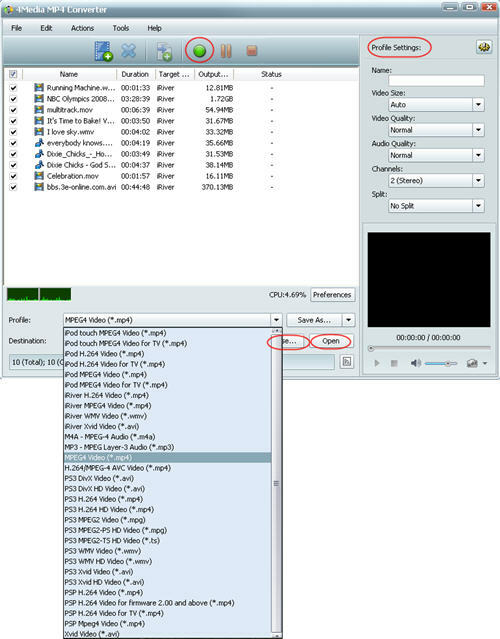 As you see, 4Media MP4 Converter for Windows makes the AVI to MP4 conversion so easy. And more useful features are included in the MP4 converter software.